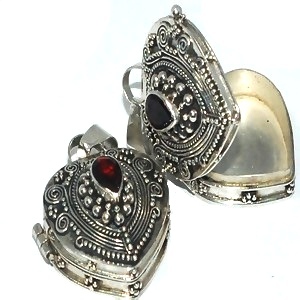 New 925 Sterling Silver Bali Hand-Made Heart Shaped Prayer Box with Genuine Garnet. A functioning lid can be used to open and close the locket to store your keepsakes. These Prayer Boxes are also known as Poison Boxes and Keepsake Lockets. All sterling is stamped 925 to assure Silver Content. All measurements are approximate. Includes the Amerta Bali blue card.